PLEASE BUY YOUR TICKET(S) ONLINE AT THE BOTTOM OF THIS PAGE! Book your flight to and from Tangier, send us your flight details and we’ll arrange the airport pick up and drop off with our local partners. The trip starts on Friday morning around noon at the hotel and ends on Sunday after breakfast with the hotel check out. Ideally, you book your flights for Friday morning and Sunday afternoon. If you want to arrive earlier or later and need hotel accommodation, please let us know to arrange it for you. Let Citylife Barcelona take you on a Moroccan trip you will never forget. With camel riding along the Atlantic Ocean, guided tours both in Tangier and Chaouen, 4**** Hotel accommodation with buffet breakfast, extra travel insurance and all the transfers included, you won’t have to worry about anything! Saturday, we travel to one of the prettiest towns in Morocco. Beautifully perched beneath the raw peaks of the Rif, Chaouen is an artsy, blue-washed mountain village that feels like its own world. We guarantee you’ll fall in love with this delightful mixture of Moroccan and Andalusian influences. 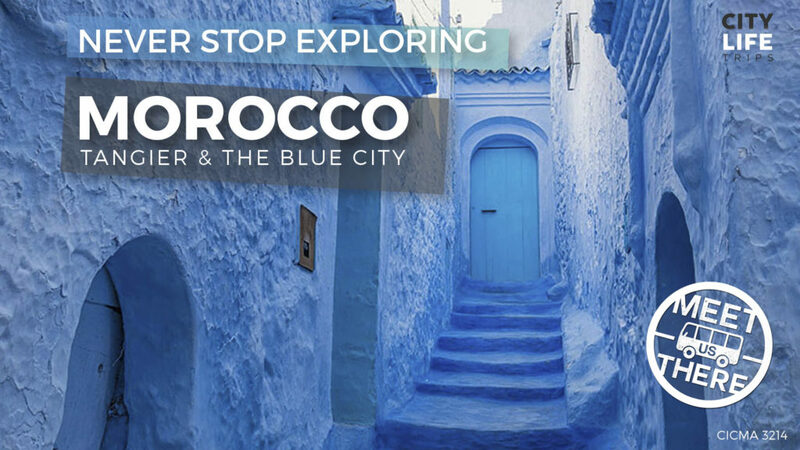 After our local tour guide takes us through this “blue city” and its best picture points, we will have free time to enjoy the local cuisine, do souvenir shopping and explore the beauty of this hidden gem. Booking: You can book online at the bottom of this page!